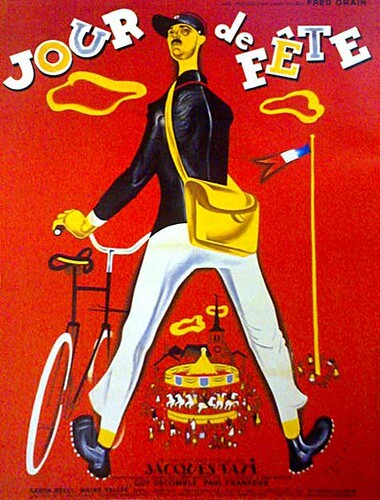 Jour de Fête – Jacques Tati (1949), BFI. The films of Jacques Tati so often place their main protagonist out of time and out of step with his various scenarios that it was to be expected that Tati’s debut feature film Jour de Fête (1949) was to bask in a similar situation. However there’s a sense of naivety due to various factors within the film that makes Tati’s debut seem not quite up to the standards he would hit later on in his often underrated career. Jour de Fête follows a clumsy buffoon of a postman called François who, on the day of the big village fête, becomes obsessed with attaining the speed and efficiency of the American postmen after witnessing an information film about them. Tati’s characters simply aren’t built to survive the frantic modern pace of the hard commercial west and are an excuse for some extremely amusing and sometimes Keaton like tom foolery. Though the film is dripping with an excess of charm and a shared nostalgia for the disappearing idyllic rural life, the set pieces are what saves it from becoming completely indigestible. With sickly music and an overuse of dialogue (in both versions present), it shies in comparison to Tati’s other masterpieces, yet there’s still much to enjoy from both versions of the film. The Thomsoncolor version has been beautifully restored and though a sharp image will never be attainable with the original technique making it impossible, the palate of colours make the whimsy seem justified and rural France has never looked so appealing a place to live. 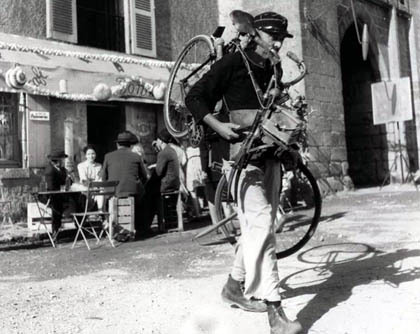 One of its successful set pieces involving the repetition of accidentally cycling into the local cafe is a joy and pre-empts the hilarious repetitive motifs later honed and perfected in the likes of Mon Oncle (1958) and Playtime (1967). Some of the more subtle humour also hits the mark, in particular when François falls down a hole after inexplicably messing around with a hosepipe. However some of the humour seems ill judged and this is no doubt a master finding his footing rather than exercising his greatness. As stated in Philip Kemp’s short but informative essay in the release’s booklet, the drunken scenes later in the film really do outstay their welcome and Tati’s lack of confidence which leads to scenes obviously focusing and zooming in on the comedic elements does stop Jour de Fête from reaching its full potential as a full blown masterpiece. The release of the film is packed to the brim with extras, editions and curios. The second version of Jour de Fête (which is really the first in historical terms due to the colourised version not being available until 1995) is presented here in all its odd glory. This 1964 version has as much to praise as to deride. The slight blurring that the Thomsoncolor process gives to the main feature vanishes in the black and white 1964 version and splashes of colour on flags and the main titles add a real element of beauty to the visuals. However the strange inclusion of a British tourist character and a persistent English voice over commenting on goings on is extremely interesting but adds little other than overseas sale potential. Along with this version, three short films are included. These are Soigne ton Gauche (1936), Tati’s first short L’ecole des facteurs (1947) and Cours de soir (1967). The three are all worth watching; if only see the evolution of the ideas and gags that would eventually emerge in Jour de Fête from the first two shorts. René Clément’s Soigne ton gauche in particular is genuinely hilarious and again has a Buster Keaton feel to its boxing themed buffoonery. Though not quite at the standard of his later films, Jacques Tati’s Jour de Fête is a worthy effort that has been given a wonderful restoration and an extensive, clearly loving release. Its discourse on the obsession with speed is a timeless and enjoyably apt subject that seems more fitting than ever in the internet age. What François would have made of email is anyone’s guess but no doubt the consequences would have been chaotic and hilarious. The BFI Restored, Duel Format edition of Jour de Fête is out on the 29th of October.